Interstitial lung disease course focused on interactive learning, full data sets with high resolution images, and discussions for radiologists to gain additional proficiency in this topic area. 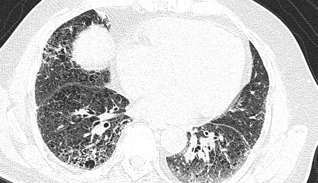 Interstitial lung disease course focused on interactive learning, full data sets with high resolution images, and discussions for radiologists to gain additional proficiency in this topic area. This course will allow radiologists to follow a systematic approach to improving their diagnostic skills to the findings seen in various forms of interstitial lung disease (ILD). Dr. Sharma is currently faculty at Harvard Medical School and staff radiologist in the Division of Thoracic Radiology at the MGH Department of Radiology. She has published numerous articles in thoracic imaging and has extensive teaching experience in radiology training for medical students, residents, and fellows. Dr. Subba Digumarthy interprets all the imaging modalities and specialized studies done for lung transplantation, diffuse lung diseases and lung cancers at Massachusetts General Hospital. Dr. Digumarthy also routinely performs percutaneous biopsy of the lung and chest wall. Considered an excellent teacher by peers, residents and fellows, Dr. Digumarthy is regularly invited to radio-pathological and case conferences, mentored both residents and fellows and published case reports, review and investigative articles. In addition, Dr. Digumarthy has prepared numerous educational exhibits winning coveted prizes at both national and international conferences. He has also contributed several review articles and chapters in various text books. Most recently he contributed several chapters in Thoracic Radiology: Requisite Series, the most popular text book of radiology among residents and fellows. As Director of Thoracic Imaging and Intervention at the Massachusetts General Hospital, and Professor of Radiology at Harvard Medical School, Dr. Jo-Anne Shepard assumes responsibility for all clinical, teaching and research activities within the Division. Dr. Shepard teaches the art and science of radiology to Harvard medical students, medical, surgical and radiology interns, residents and fellows and international visiting physicians. She is Director of the Cardiothoracic Imaging Fellowship Program at Massachusetts General Hospital and an examiner in Cardiothoracic Radiology for the American Board of Radiology (ABR). Since 2000 she has been Associate Editor in Radiology for the Case Records of the Massachusetts General Hospital, New England Journal of Medicine.